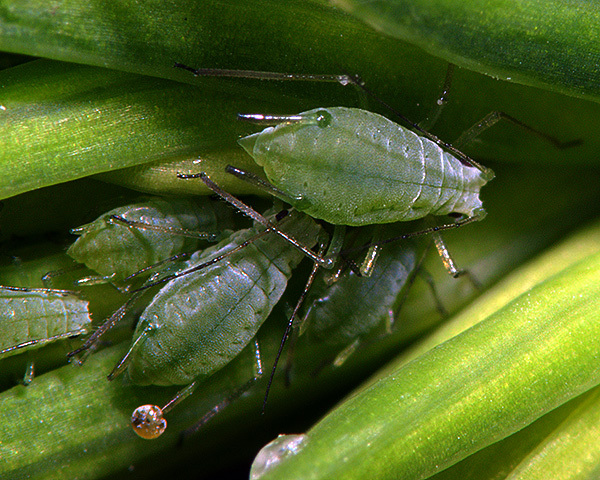 Illinoia are medium to rather large usually greenish aphids with long siphunculi. The antennal tubercles are well developed, with their inner faces divergent. The median tubercle is frequently also well developed. The siphunculi are weakly to moderately swollen, similar to those of Amphorophora, but with a few rows of rather large polygonal cells occupying the distal 0.06-0.2 of total length. The cauda is shorter than siphunculus, slender and finger shaped. There are about 45 mostly North American Illinoia species, although some have been introduced to other parts of the world including Europe. Most species retain a sexual stage in the life cycle. There is no host alternation and many species in the two main subgenera are associated with the Heath and Rhododendron family (Ericaceae). Other species feed on taxonomically diverse plants. They are not attended by ants. 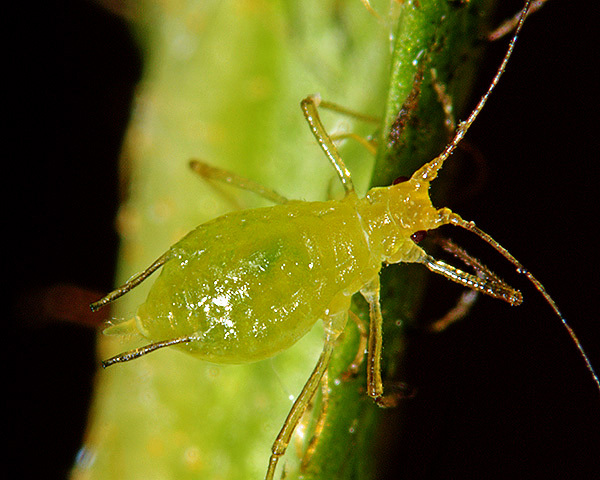 Some species are important pests of ericaceous plants. Winged and wingless Illinoia lambersi both exist as green, pink and yellow forms (see first picture below of yellow aptera) which can occur in mixed populations (cf. Illinoia azaleae which is always green). The apices of the antennal segments and the tips of the legs are dark. The second segment of the hind tarsus is rather short and less than 1.5 times longer than maximum diameter of the swollen part of the siphunculi (cf. Illinoia azaleae which has the second segment of the hind tarsus more than 1.5 times longer than that diameter). The siphunculi are mostly pale but with darkened apices. They are slightly swollen, strongly attenuated near the tip, and 2.0-2.5 times longer than the cauda. The cauda is mainly pale but dusky towards the tip. The body length of Illinoia lambersi apterae is 2.2-3.3 mm. The alate of Illinoia lambersi (see second picture above of green alate) has rather indistinct abdominal marginal and intersegmental pleural sclerites. The antennae are only slightly longer than the body and have 21-30 secondary rhinaria placed along the whole segment, not precisely in a row (cf the antennae of Illinoia azaleae which have 7-21 secondary rhinaria in a row). Colonies of Illinoia lambersi are mainly found on the new shoots and flower buds of rhododendrons and azaleas (Rhododendron), but have also been found on holly (Ilex aquifolium) (cf. Illinoia azaleae which mainly occurs on azaleas). Illinoia lambersi is indigenous to North America where it is widely distributed and sexual forms occur. It is now also well established on rhododendron in South America (Chile), Japan and parts of Europe including Denmark, England and the Netherlands where it overwinters as viviparae. Illinoia liriodendri apterae are spindle shaped and pale green, lightly dusted with wax (see first picture below). There are also yellowish and pink-red forms. The antennae are black except at the bases, and are 1.2-1.6 times as long as the body. 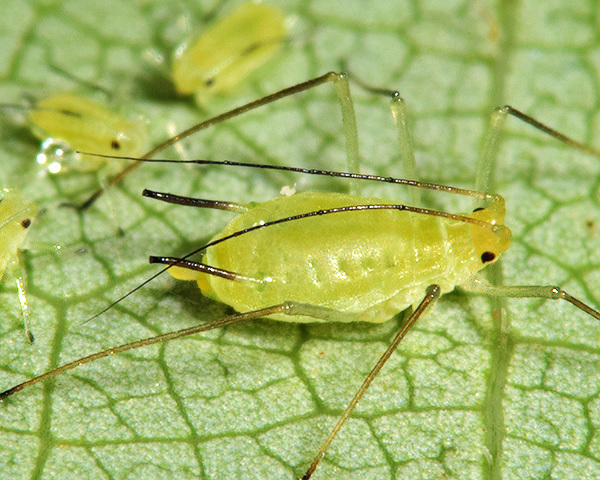 The legs are pale green except for black apices to the tibiae and tarsi. The siphunculi are black except at the base, and are 2.3-2.9 times as long as the cauda. They are slightly swollen on the distal half, sometimes bent outwards, and with reticulation on the apical one-tenth to one-eighth. The cauda is pale greenish-yellow and is elongate. 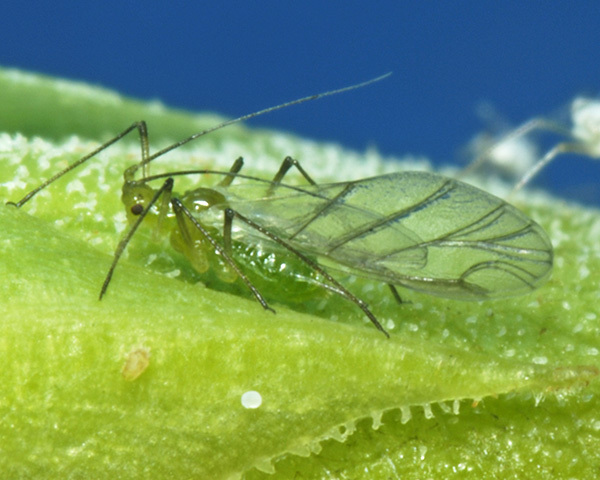 The body length of an adult Illinoia liriodendri aptera is 1.7-2.5 mm. The Illinoia liriodendri alate (second picture above) has a brown thorax, a greenish-yellow abdomen and black antennae and legs except for the bases of the femora. 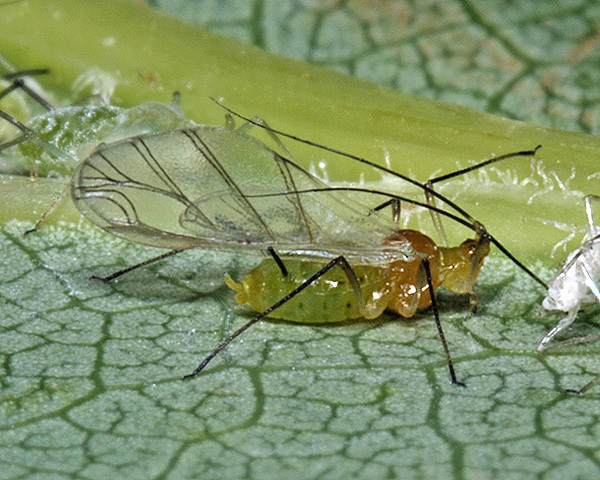 The tulip-tree aphid feeds on undersides of the leaves of tulip tree (Liriodendron tulipifera). Dense populations can build up resulting in large deposits of honeydew on the leaves. Sexual forms occur in autumn. Illinoia liriodendri is native to North America, but in 1998 was found in France. It has since been reported in other European countries and in Japan. Adult apterae of Illinoia morrisoni (see first picture below) are spindle-shaped and rather dark apple green in colour. The antennal terminal process is 3.6-4.7 times the length of the base of the sixth antennal segment. The first tarsal segments usually have 3 hairs, all subapical, and the apices of the legs are dark. The siphunculi are distinctly swollen and darkened at the tips. The adult apterae are rather small with a body length of 1.5-2.3 mm. Immature Illinoia morrisoni are dusted with a fine wax powder (see second picture below). Illinoia morrisoni feeds on the terminal leaves and shoots of many species of conifer, mainly in the Taxodiaceae (e.g. Sequoia, Taxodium) and Cupressaceae (e.g. Chamaecyparis, Cupressus, Juniperus, Thuja). Sexual forms have not been described, and it appears to overwinter as parthenogenetic forms. 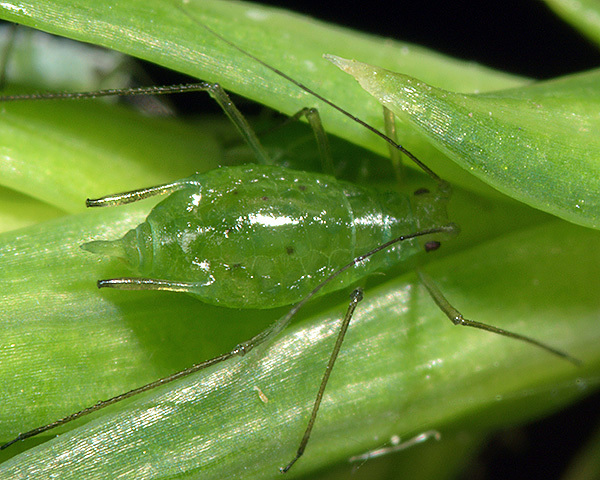 The sequoia aphid is indigenous to western North America, but has now been recorded from Central and South America and several parts of Europe (Britain, France, Italy and Portugal).